The Connecticut pro chapter of the Society of Professional Journalists will honor Don DeCesare and James H. Smith with the Helen M. Loy Freedom of Information award at the CTSPJ annual awards dinner May 22. DeCesare and Smith, as members of the Task Force on Victim Privacy and the Public’s Right to Know, each fought for more access to crime scene photos after the legislature passed a law exempting the records from public release. DeCesare and Smith disagreed about the best strategy to try to change the law, which was passed — behind closed doors — in response to the killings at Sandy Hook Elementary School. Yet both men spent dozens of hours of their personal time working to change the law to allow the public to again have access to crime scene photos. For that tireless effort, CTSPJ thanks DeCesare and Smith. DeCesare is past chairman of the Connecticut Broadcasters Association. DeCesare has worked for more than 40 years in broadcasting, including many years at CBS Broadcasting in New York City where he went from editing radio broadcasts to overseeing television news coverage. He is now president and general manager of WLIS-AM, Old Saybrook and WMRD-AM Middletown. DeCesare was a founding member and past board member and treasurer of CT-N, as well as a member of the Media Center Advisory Board for Middlesex Community College. Smith, a retired journalist of 42 years, is president of the Connecticut Council on Freedom of Information. Smith has served as president of the New England Society of Newspaper Editors, and is a member of the New England Newspaper Hall of Fame. He led the Connecticut Post, The Day of New London, The News-Times of Danbury, the Record-Journal of Meriden and the New Britain Herald to their first New England Newspaper of the Year awards. Smith won the American Society of Newspaper Editors’ Distinguished Writing Award for a selection of his columns on the First Amendment. He is the four-time winner of the First Amendment Award from CTSPJ. The Connecticut pro chapter of SPJ honors people who work to advance open government in Connecticut. The late Helen M. Loy was a former chairwoman of the Freedom of Information Commission, and one of the trio of original members appointed by then-Gov. Ella T. Grasso. Loy served as a commissioner from 1975-1985 when she died. She worked in various local and state government positions throughout her career. Upon her passing, CTSPJ named its annual Freedom of Information award in her honor. The Task Force on Victim Privacy and the Public’s Right to Know met for the last time Jan. 24 and approved its final report. The final recommendations from the task force represent a compromise regarding the different viewpoints from the 17 members. The compromise recommends the legislature allow for review — but not release — of certain criminal records, which are now entirely exempt from disclosure under Public Act 13-311. My support of the compromise comes reluctantly, as I do not agree with its recommendations. However, I supported the compromise because I believed it was the lesser of two evils. A revision to the state’s FOI act approved by the Connecticut General Assembly in 2013 added unnecessary restrictions to the release of public information regarding crimes. When asked to appoint four members to the task force, the Connecticut Pro Chapter of the Society of Professional Journalists (CTSPJ) did so with the hope of regaining all of the transparency that was lost. My first choice would have been to repeal Public Act 13-311 and revert the FOI Act to its existence prior to June 2013. I supported a compromise because it allows review — albeit under burdensome circumstances — and provides a window into possible release. The task force was stacked with members who indicated they wanted to see MORE restrictions on the release of public records. FOI and press advocates were in the minority. It became clear the best chance at getting movement away from a bad law would be to meet in the middle. The Task Force held public hearings — an important step that was ignored during the crafting and approval of Public Act 13-311. After hearing broad and balanced testimony, the Task Force came to the consensus that the law needs to be changed. Public Act 13-311 is not appropriate. It lacks the transparency required in our democracy. While not ideal, the compromise is a shift in the right direction — one supported by even those on the board who initially wanted more restrictions. The standard for release should be Perkins, not Favish. The burden should not be on the public to prove a record should be public, as the Favish standard requires. Both Public Act 13-311 as it exists, or the task force’s proposed use of the Favish standard bring Connecticut to the bottom half of the state FOI spectrum in regards to openness and transparency. The addition of 911 calls to the Task Force recommendation is a bad idea. The legislature wisely left 911 calls out of the original act. I hope this Task Force recommendation is a first step toward a widespread conversation about the need for open government and a move back to the respected FOI Act our state has long had. The Task Force on Victim Privacy and the Public’s Right To Know voted to recommend the Connecticut legislature change a law it passed last year limiting the public’s access to information from crime scenes. The compromise — reached after months of meetings on the topic — does not bring the public’s access back to the level it was prior to passage of Public Act 13-311. The deal results in a recommendation that would allow the public to view crime scene photos from homicides, but requires an appeal in order to get access to the records. Click the links to view coverage of the final meeting from the Hartford Courant, the Danbury News-Times and CTNewsJunkie. The video embed above is CT-N coverage of the Dec. 17 task force meeting. Connecticut SPJ, which appointed four members to the task force, including CTSPJ President Jodie Mozdzer Gil, wanted to see the FOI act returned to its original state. However, facing an uphill battle against a task force heavily weighted toward privacy advocates, the compromise seemed like the only way to gain back some of the lost access to the important public records. Being able to look, but not copy, public records was a compromise to ensure the availability of the records. The following is a statement from the Connecticut Pro Chapter of SPJ, regarding the FOI Commission decision on the Newtown 911 calls on Sept. 25. We’re pleased the FOI Commission upheld its hearing officer’s report demanding release of the 911 calls from Newtown. The decision was appropriate, and reflected the FOI Act requirements for public disclosure. If the case is appealed, as expected, we urge the higher courts to come to the same conclusion: That 911 calls are important public records. The 911 calls surrounding an incident allow the community and the press to assess official response, and to try to gain a better understanding about what happened. The decision of whether material is appropriate for publication or broadcast should not be made by the government; it should remain with the journalists, guided by the various journalistic codes of ethics. The Task Force on Victim Privacy and Public’s Right to Know will host two public hearings in October, to solicit input from the public regarding a state law that limits crime scene documents after homicides. The task force will also hear testimony from public officials and other experts during its regularly scheduled meeting Oct. 2 in Hartford. All members of the public are invited to attend, to give testimony about the task force’s mission — to determine the balance between victim privacy and the public’s right to know. The task force was created after the Connecticut legislature approved a law that limits public access to crime scene documents in the wake of the Newtown elementary school shooting. For more information on the task force, visit the website here. The “Task Force to Consider the Balance between Victim Privacy under the Freedom of Information Act and the Public’s Right to Know” met for the first time on Aug. 1 at the state Legislative Office Building in Hartford. The task force took no action, but began discussing its task and how it would organize. The 17-member task for was formed by the legislature as part of a law blocking access to crime scene documents in the wake of the Newtown shooting. The materials from each task force meeting will be posted on this website. 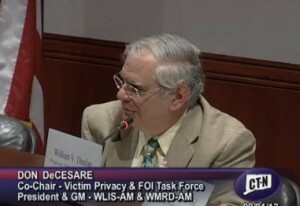 Connecticut Senate President Pro Tempore Donald E. Williams, Jr. has appointed longtime broadcaster Don DeCesare to be a Co-Chair of a new 17 member Task Force on public information and privacy, the body mandated by the 2013 Legislature’s public records legislation. DeCesare of Norwalk, Conn. is a Past-President of the Connecticut Broadcasters Association and one of two members of that organization to be named to the Task Force. He will serve as Co-Chair with State Rep. Angel Arce of Hartford, who was appointed to that position by the Connecticut Speaker of the House of Representatives, Brendan J. Sharkey. DeCesare is President and General Manager of WLIS-AM in Old Saybrook, Conn. and WMRD-AM in Middletown, Conn. A journalist for more than four decades, he spent 20 years at CBS Broadcasting in New York and globally. At CBS, DeCesare went from editing radio broadcasts to overseeing television news coverage and senior management. He served as Chair of the Connecticut Broadcasters Association from 2005 to 2007. During that time, the Association led the successful effort to adopt a strong Shield Law for Connecticut. A founder and past Treasurer for CT-N, DeCesare also is a member of the Media Center Advisory Board at Middlesex Community College. He has contributed opinion pieces to a variety of publications. The other member of the Connecticut Broadcasters Association to be appointed to the task force is Klarn DePalma, the organization’s current Chair. DePalma is Vice President and General Manager of WFSB-TV 3 Hartford, Conn. and WSHM-TV 3 Springfield, Mass. He also oversees the National Sales team for the Local Media Group of the stations’ parent company, Meredith Corporation. The Cheshire, CT resident joined WFSB as a Sales Account Executive in 1993 and became the station’s Local Sales Manager in 1998. In 2002, he rose to Director of Sales of both WFSB and WSHM and, in 2005, was promoted to Vice President and General Manager for both stations. DePalma serves on the Board of Trustees of the Connecticut Science Center and the Channel 3 Kids Camp, and is a faculty member at Howard University. DeCesare and DePalma were two of four media members appointed to the task force by the Connecticut Pro Chapter of the Society of Professional Journalists (CTSPJ). They are joined by journalists Brian Koonz, Metro Editor for the Connecticut Post in Bridgeport, and Jodie Mozdzer Gil, President of the Connecticut SPJ Board and Assistant Professor of Multimedia Journalism at Southern Connecticut State University in New Haven, CT. The Task Force totals 17 members. Other members include a representative from the Connecticut Council on Freedom of Information (CCFOI) and the Executive Director for the FOI Commission, as well as legislators, attorneys, and representatives of law enforcement. The legislation creating the Task Force calls for it to produce a report, including recommendations, to the Legislature by January 1, 2014. Since its establishment in 1955, the Connecticut Broadcasters Association has been a respected industry leader in legal, governmental, education and community issues on both the State and National levels. Members include broadcast TV stations, radio stations, vendors and companies with a business interest in broadcasting, educational facilities, and individuals with involvement in the broadcasting industry. For more information about the association, visit www.ctba.org or call (860) 305-2038.